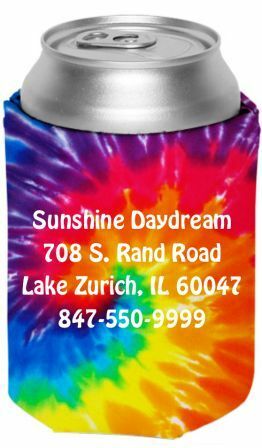 Keep your hand warm and your beer ice cold with our very own Sunshine Daydream Tie Dye Koozie. Our tie dye collapsible can insulators also know as coolies, can huggers, and coozies are made of polyurethane foam and are perfect size to hold a 12 oz can of your favorite beverage. In case you forget where you got your cool tie dye koozie, we have printed our name, address, and website on it to help jog your memory.